This is a revised and expanded version of a piece I published a little while ago which my pupils found gave a very accessible route into some very meaty challenges. They enjoyed them so much that I kept on thinking of new things to do and which gave them some high-quality experiences in the National Curriculum’s requirements for Fluency, Reasoning, and Problem-solving. Here’s a screenshot from what you’ll see is a very old – and incidentally my very favourite – computer game. The letters A to J, in no particular order, stand for the digits 0 to 9. It struck me recently how neatly this 30-year-old task met today’s demands for Fluency, Reasoning, and Problem-solving. It’s one of the best activities I know for generating high-quality discussion, and it requires the use of number facts in an situation that’s both challenging and purposeful. However, I’m pretty sure you’ll agree that as it stands it does look rather bleak and even threatening, so I wanted to find some form of presentation that enhanced its accessibility across the ability range. 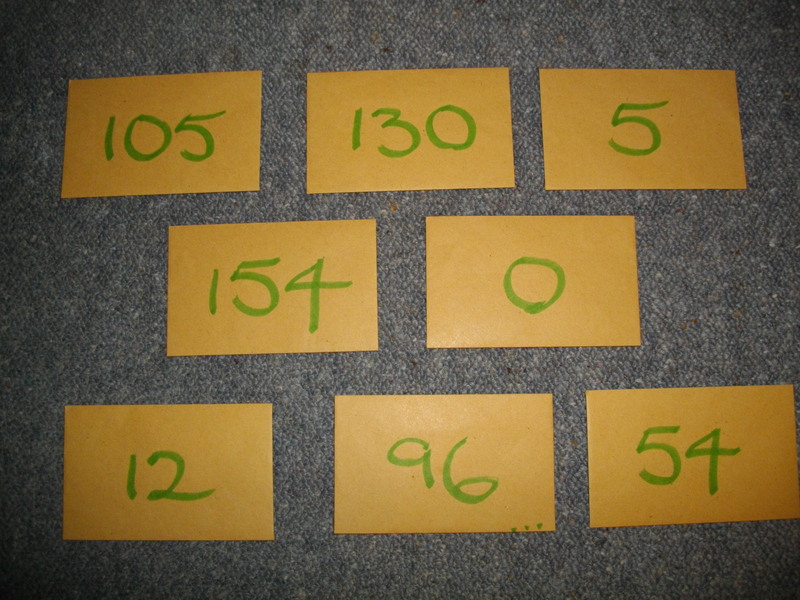 So I show children a set of 0 to 9 digit cards and – hiding the numbers – put two in each envelope. On the front of each envelope I put the sum of the two cards. Now these two are bang in the middle of the attainment range, and it seems to me you’ll very rarely hear such a long chain of watertight reasoning. And here’s how they (spontaneously) made a record of their progress through the problem. I’ve used my envelopes with lots of children and I can’t recall any group not wanting to tackle another set. 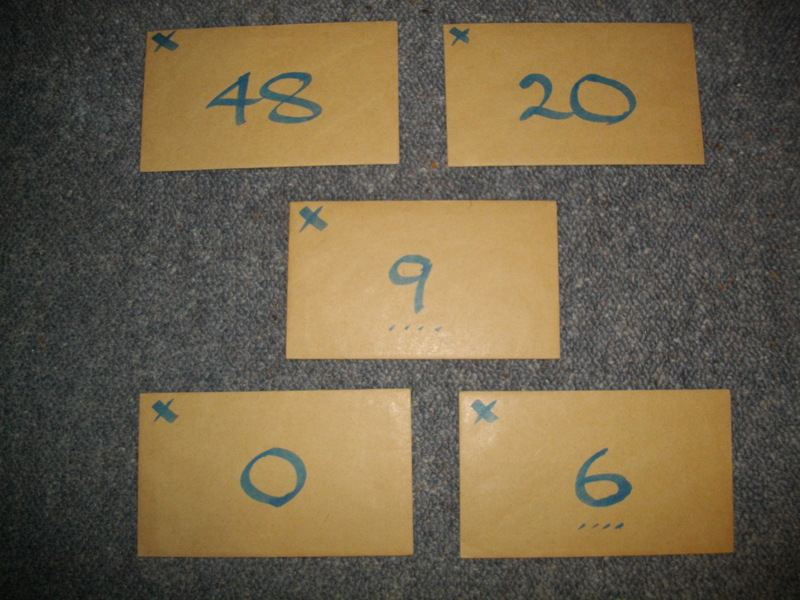 Once they’ve done two or three it’s pretty seamless to move onto a set where the envelope shows the product of the two numbers inside (which is the sort of problem presented by the computer game). 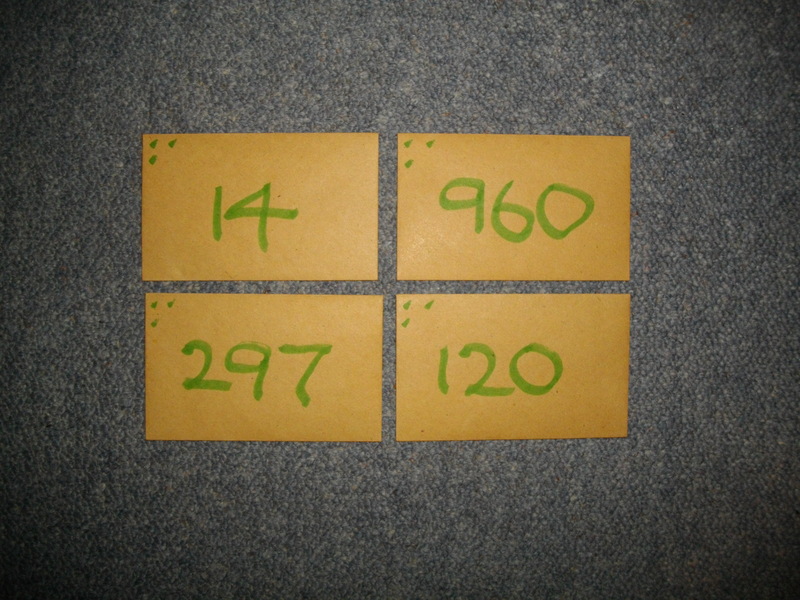 Pupils discover that the envelopes with bigger numbers tend to be a good place to start (and the 0 is the very worst). For a long time that’s all I’d do with the envelope idea, but this term’s pupils have been so enthusiastic that I’ve made lots more sets. These weren’t enough, so we went to bigger sets still. 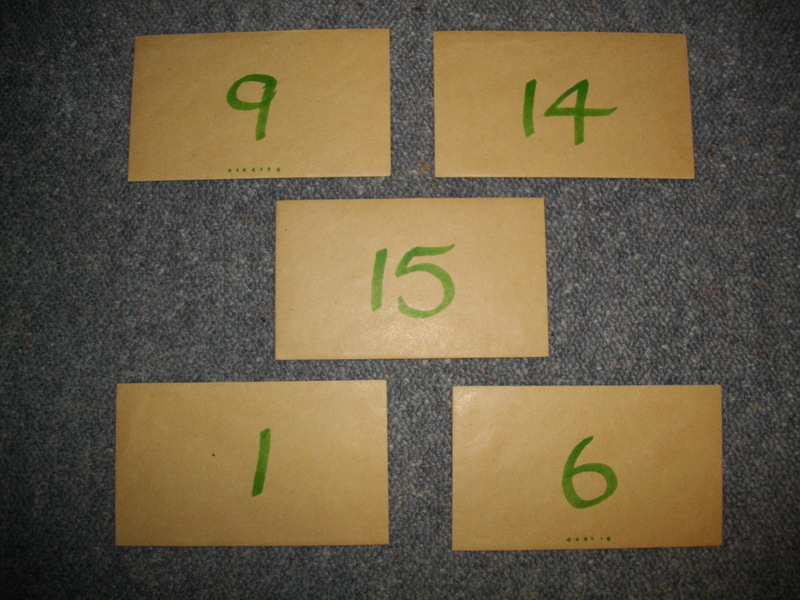 I discarded the 0, so here we have a set of ten envelopes, using the cards from 1 to 20 – why settle for tables up to 12 when you can use your 17, 18, and 19 times tables as well? 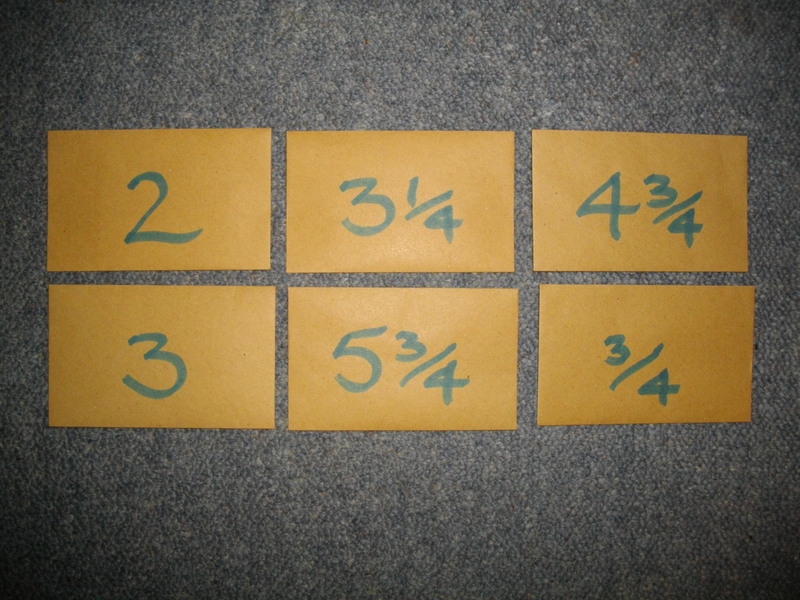 And of course, just as it’s usually nice to work with bigger numbers, it’s normally a good idea to work with small ones, so these use a set of twelve cards using ¼, ½, ¾, ….., 2½, 2¾, 3. These envelopes carry the sum of the two cards, but my most adventurous pupils have even been happy to use this set of cards and explore what might appear on envelopes which show the product of the cards inside. Working with the envelopes has been enormously successful with my pupils, none of whom are of higher than average attainment. I’ve only called a halt because I didn’t want anyone to say “Oh no, not envelopes again!” (though I’m pleased to say there haven’t been any signs of that). We certainly went out on a high. 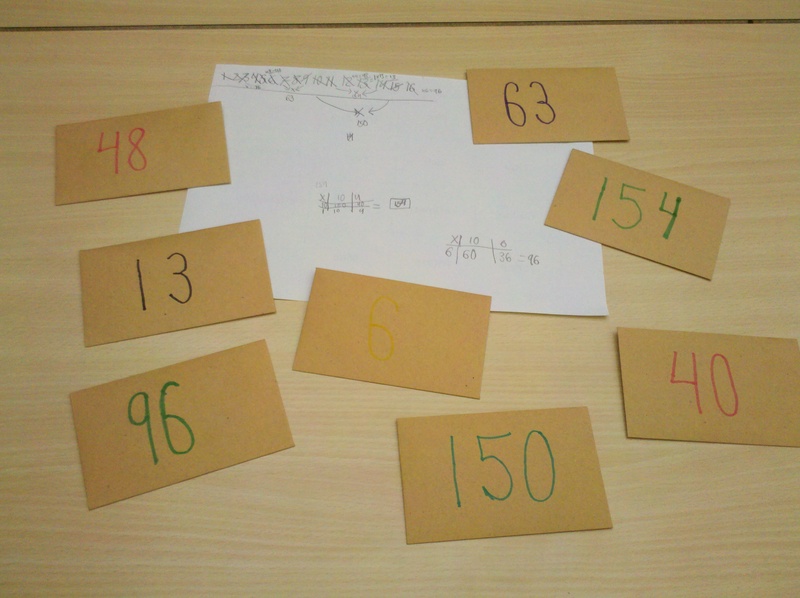 One group made their own sets with 1 to 16 cards and used them to challenge the pupils in the group taking the Level 6 paper – yes, they managed to do them, but they certainly didn’t find the exercise trivial. 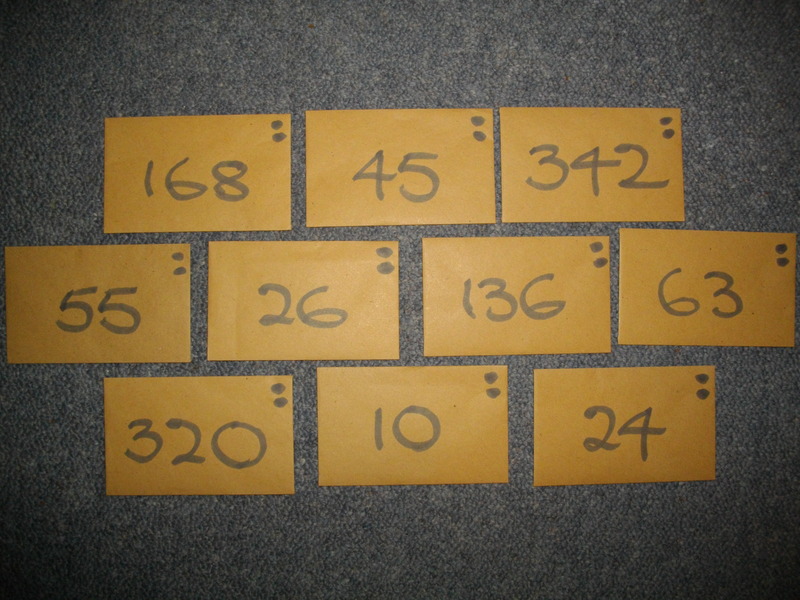 Another group – of average ability, remember, were happy to solve this multiplication set and do so mentally, where each envelope contains three cards from a 1 to 12 set. The challenge to fluency, problem-solving, and reasoning seems gratifyingly high. I’m sure others will be able to come up with other interesting envelope activities, and I’d love to hear of further suggestions. This sounds like such a great activity! I love how the content of the envelope seems like a secret waiting to be uncovered. I hope you keep writing about this, sharing the students’ conversations. It’s amazing how much difference to perception the presentation makes. 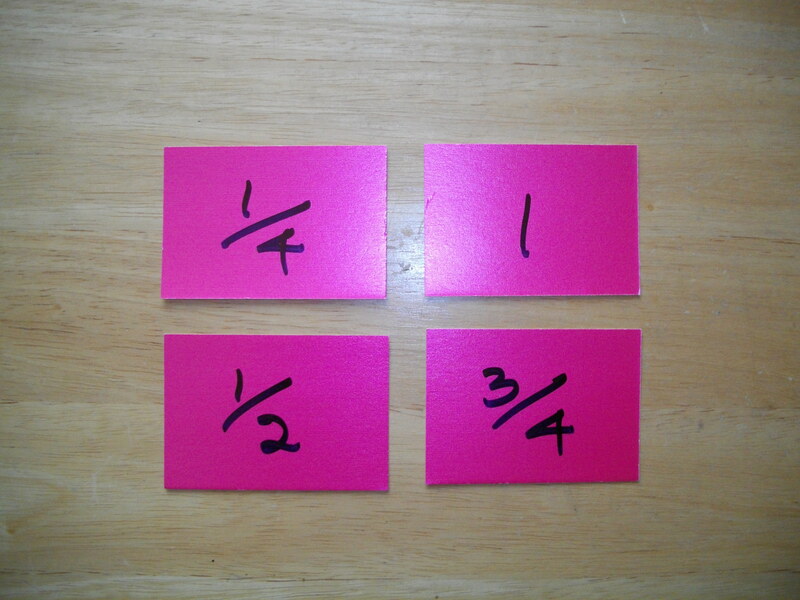 “One of the cards in the 48 envelope is 6; what’s the other one?” is fun. 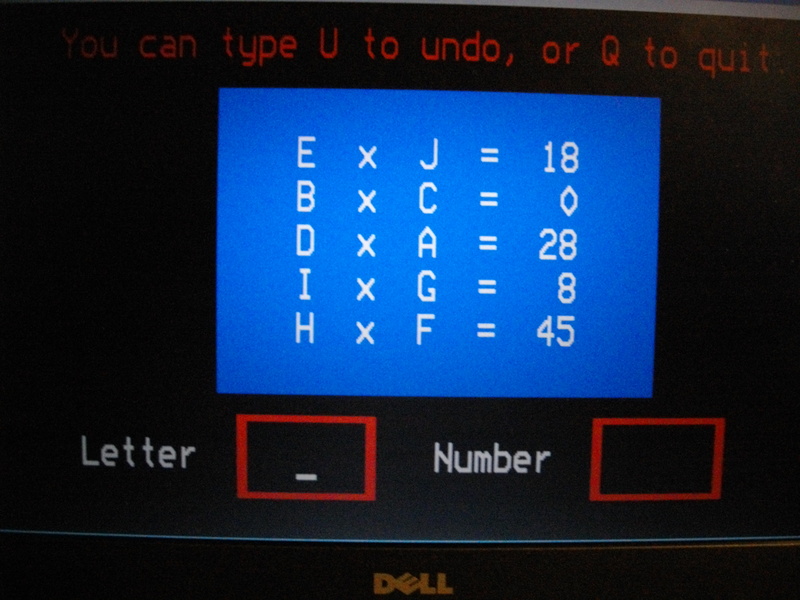 “Find z if 6z = 48” is another matter entirely. My current pupils are starting a new challenge next week. I’ll keep my ears open for interesting conversations. It would be quite a bit of work, but you could write a story problem on the envelope in which the answer to the problem is given, but the numbers and operations needed to solve the problem are missing. I like this one. I think I might try the first addition one with groups in my Year 4 class this term. It would be interesting if they could record their logic for how they know! Like you say, the activity invites a sequence of conclusions that amount to a proof. Do let me know how it goes. You and your children produce such brilliant work I can’t wait to see what you make of it!